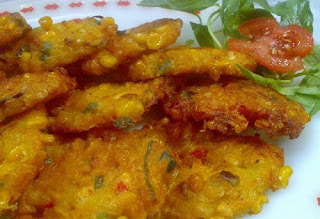 Corn bakwan or corn omelet who nicknamed this is one food that is made from corn, wheat flour, eggs, and other supporting materials, where the food is cooked by frying. First pipil corn first, then set aside. You could use a steak knife to make it easier memipil corn. Furthermore, peeled and sliced ​​garlic and onion, put into a mortar joint coriander, sugar and salt, then grind until completely smooth. Enter the corn that had dipipil into a mortar with spices that have been refined before, and then grind it all up a bit rude (ndak be too soft, a little rough just let krenyes later). Add the flour and eggs, then stir until well blended. If still less abrasive, you can add more flour, and do not forget to stir again until well blended. Sliced ​​scallions, minced chili, then insert it into a fried dough. Taste the taste, just right or not. If it was already close to the heart (Alay: p), pour the oil into a frying pan (suggestion: oil is a lot of, well, let the dough the scrambled sank perfectly), then fried until golden brown. If it is cooked, remove, and bakwan corn was already ready to eat. Bakwan corn is very well suited delicious when served with tamarind vegetable. But if you want to eat it as a snack is also not a problem. Hopefully you successfully make this tasty corn bakwan.